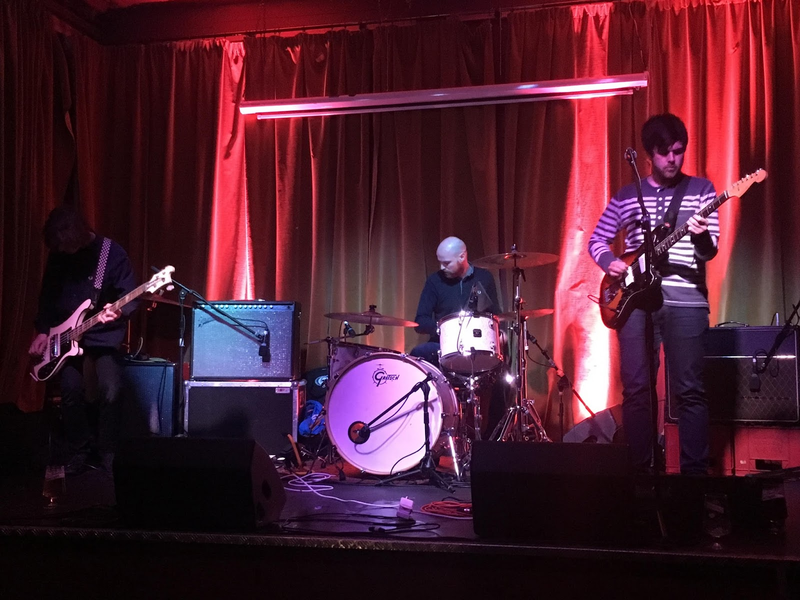 Fresh from being hailed as one of the six bands to save rock and roll, Déjà Vega took to the Gullivers' stage to demonstrate just why there's a small but growing band of people who believe that to be the case. Their six song set showed their ability to overpower an audience with a wall of noise that's on the very brink of distortion, yet with the separation between guitar, drum and bass that allows the underpinning melody of the songs to shine through. They also debuted a new song that shows that they're also capable of something that might just turn the ears of notoriously fragile radio pluggers the land over. For a three-piece band that make so much noise they're an unassuming bunch, there's no histrionics, no big shows of emotion, just raw power that they summon from their instruments and Jack's voice. This is most evident on their final track, the ten minute The Test, a song that lends itself to the intuitive improvisational spirit that Déjà Vega thrive upon, something that creates enough ideas in the final few minutes to fill a whole album. It's a philosophy that runs through the entire set though and one that may challenge them as they go into the studio to record their debut album. That's for another time than tonight though. For now the crowd watch on awestruck as the likes of Telephone Voice, Eyes Of Steel and their most recent single Friends In High Places threaten to blow Gulliver's system, the sound man already having to ask them to turn things down as they tuned up. As we stated earlier though, to dismiss them as mere noise merchants would be to ignore everything that makes them such a unique proposition, that ability to be both ear-shattering and melodic at the same time. The new song leans more to the latter, a pulsating beat from Tom and judicious use of the effects pedals driving the song along in a slightly different direction. Gigslutz got it right when they said Déjà Vega could save rock and roll, the question is whether it would know its saviour if it slapped it in the face.